Driving about on Møn Island’s country roads is a pure delight with this crazy spring season. If you go to Møn to see the amazing chalk cliffs, the Møns Klint, don’t miss a road-trip across the island to check out the other treasures it has to offer, like the famous Medieval painted churches, several megalithic sites, and small harbours, and why not make a detour to the beautiful and wild small island of Nyord. Between each stop, you cannot but enjoy the so lively nature, the gorgeous old houses with their thatches roofs, or even the wide pastures revealed bit by bit as we pass the hills. That’s the point of visiting Møn by car (see other possibilities of travelling there): being able to smell the scents sometimes salty sometimes flowery of this lovely little Danish island. We visited three churches: Fanefjord, Elmelunde and Keldby. Clearly, the fact that we stayed on the opposite side of the island from the cliffs, at the Fuglehavegård B&B, gave us the opportunity to visit Fanefjord Church. The most beautiful one according to us! From outside, the churches of Fanefjord and Elmelunde look very much alike with their whitewashed walls, whereas Kelby Church looks different with its red bricks. They all date from the 10th to the 13th century and have been well renovated. Inside, magnificent frescoes are painted on the ribbed vaults ceiling, showing scenes of the Christian history like a comic strips from the old times. Ex-votos of ships hang from the ceiling. 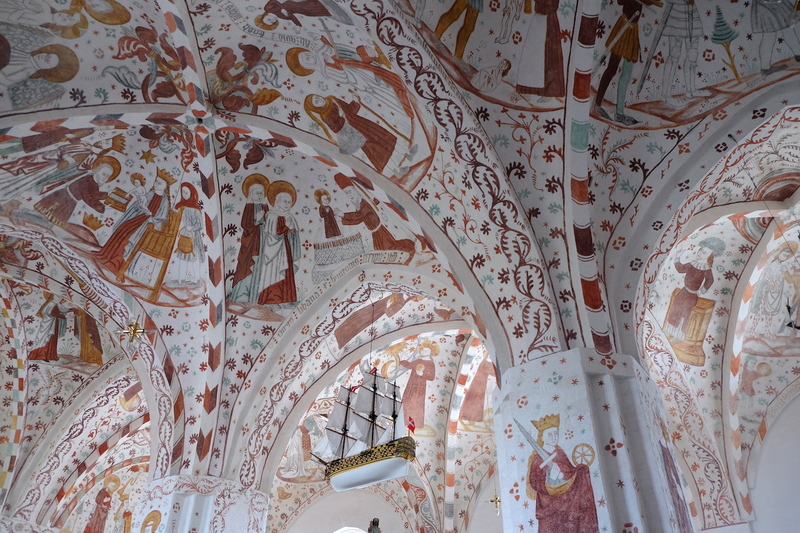 If Elmelunde Church is the oldest one, Fanefjord Church is the most beautiful with its double ribbed vault ceiling and its numerous handpainted scenes. Kelby Church is different, touching in sobriety with its modest brick floor. I really like these sober, luminous, lively churches. They are very different from the churches from Southern Europe where time seems unchanged, either on the look of the place and its use. If I could digress a little, this makes me think that the Danes (and more generally the Scandinavians) are very good at keeping churches lively and open to everyone, by reinvesting them and organising various events for the community, such as concerts, but also baby development classes, flee markets, etc. I remember feeling surprised one day when in a Swedish church, I saw a playing area for kids where they could wear fancy dresses, draw or play around a carpet and small tables. This hadn’t even crossed my mind that we could use this space for today’s activities, and thus turning this into something else than a dark, cold and somewhat dusty place where laughing and speaking loud are not something allowed to do, and where fewer and fewer people recognize themselves and are not inclined to go to after all. Located to the Northwest of Møn Island, Nyord Island can be reached thanks to a bridge continuing with a road crossing a bird reserve and ending at the small village of the same name. It’s very pleasant to walk around in the village at the end of the day among the colourful houses and the flowered gardens. Further down, there is a tiny harbour. And if you drive through Stege on the way to Nyord, stop at the bakery called Høyers Konditori* to buy some wienerbrøder (Danish pastries) – tebirkes (with poppy seeds), kanelsnegl (made of cinnamon), spandauer filled with vanilla cream, or even as we did a big spongy kanelstang to share, sitting at a wooden table facing the marina. The light is awesomely beautiful and this is a great moment to put an end to this nice 3 day-trip on a high note. *They also bake a typical bread from Møn, called Mønsk Sigtebrød, quite dense but tasty made from the locally produced rye. • The churches: Fanefjord is interesting for its beautiful paintings, whose bright colours are gorgeous. Another good thing is that we can get explanations on the painted scenes on a hard cover paper to borrow at the entrance. Elmelunde, which is very similar to Fanefjord unless it’s not as stunning, is still the oldest church of the island, and its pulpit is worth the visit. Kelby has a different rather soberer style, but however very nice with some paintings also on one of the walls. • The megalithic sites: A few steps away from Fanefjord Church stands the island’s biggest burial mound, called Grønsalen, 102 meters long with three tombs. We can walk on top and see two of them open. Other burial mounds and dolmens can be seen across the island. Bonus: as all roads lead to Stege, on Møn Island, don’t miss the beautiful sunset you can enjoy from the harbour.